The Kent Messenger Charity Group held their annual forum at The Mercure Great Danes Hotel in Maidstone on Friday 13th October. The forum recognised work of charities and schools for their hard work and dedication. Mark styles attended from The East Kent Group of MNDA, who are the Kentish Gazette Charity of the Year 2017. MNDA East Kent was awarded A Gold Charity Mark Award, which was received on our behalf by Mark Styles. Mark also collected a Brain and Brawn Triathlon Award on behalf of Clive Hudson, who for health reasons was unable to be present on the day. Mnda East Kent would like to thank KM Charity Team and the KM Group for all the support we have received during 2017 as Kentish Gazette Charity of the Year. If your family or your friends have ever been affected by motor neurone disease, please help us to help other families living with this terrible disease. We need people willing to help in many ways, from joining our committee planning for the future, running fund raising events, helping with social media, helping with our web site or helping out at our events. Thanks you for reading this request and we hope to hear from you soon. A team of 4 comprising Lucy Powell, Chrissie Batts, Clive Hudson and A N Other will abseil off a tall building in Maidstone to raise funds for MNDA in East Kent. You can support our event by visiting https://www.justgiving.com/fundraising/Maidstone-Abseil?or you can text MABS85 ?5 to 70070 to?donate ?5 from your phone, or MABS85 ?10 to 70070 to donate ?10. Thanks for reading this post.? We look forward to your continuing support. Our Campaigns Contact volunteer, Katy Styles, tells us her story about why she volunteers for the Association? ?The MND Association support people living with MND, but did you know it also supports those with Kennedy?s Disease, their carers and families. ?But how much do you know about this rare disease? Kennedy?s Disease is also known as Spinal Bulbar Muscular Atrophy. It is a rare disease and no one currently knows how many people live with it in the UK, so you may not have come across it as a volunteer or member of the Association. Kennedy?s Disease is a progressive neurodegenerative disorder which means that people with?it live with muscle wasting, mobility and breathing problems, swallowing and speech problems and a range of hormone problems. My husband Mark was diagnosed with Kennedy?s Disease six years ago, until then?we had no idea that it ran in his family. He has gone from being physically active to depending on crutches and a wheelchair to get around. He uses a breathing machine at night to support his weakened chest muscles. He also?has a modified diet as he has problems choking. In addition, he is monitored regularly for diabetes, a complication of Kennedy?s Disease. Kennedy?s Disease has many aspects people living with MND would recognise. When we first joined the Association, little was spoken about Kennedy?s Disease. I met volunteers and staff who have never heard of the disease and if they had they were not aware of the problems someone with Kennedy?s would face. ?Mark and I knew then that we needed to volunteer with the Association to change this and through volunteering we could ensure that Kennedy?s Disease would be talked about and better understood. I never realised when I first volunteered for the Association what difference raising awareness of the disease would make. Now there is a dedicated clinic supporting people with Kennedy?s Disease with a research programme. We?ve mentioned Kennedy?s Disease in Parliament and in March the Association, the clinic and UK Kennedy?s Disease (a charity set up to fund research into Kennedy?s Disease) are holding the first ever Kennedy?s Disease patient?s day. Things have come a long way in the four years we have been involved with the Association. What can you do as a volunteer to support someone with Kennedy?s Disease? Show them the MND pamphlets and literature provided by the Association, as these also apply to people with Kennedy?s.? For more information about Kennedy?s Disease please download information sheet 2B from our publications list. We need someone to act as our group correspondent, to respond to queries and direct emails to the appropriate member of our committee. If you have the skills to send out agendas, take notes of meetings send out minutes, and a few hours you are willing to spare, we would love to hear from you. Our meetings take place every other month in Canterbury.? The duties would be sending out agendas by email, attending meetings which last 2 hours and sending out minutes of those meetings by email. Please email chair@mnda-eastkent.org.uk?or telephone 01843 579941. 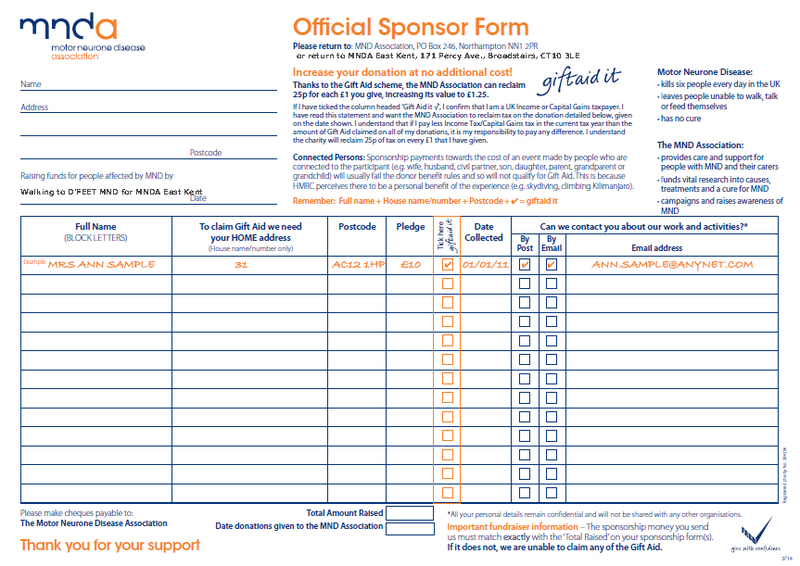 You can view our web site at www.mnda-eastkent.org.uk to see what activities we are involved in. Thank you for reading, we hope to hear from you. MNDA East Kent has been selected as Charity of the Year by the Kentish Gazette and we have introduced many events run by Kent Messenger Charity Team?into our schedule. Our first KM event will be abseiling off?the tallest building in Maidstone, we would welcome any volunteers to undertake this challenge for us, to raise money for MNDA in East Kent. Our provisional schedule of events for 2017 is as follows.? There will doubtless be changes and additions, but these are the events known in December 2016 and these form the basis of our plans for 2017. 3rd Feb Race Night – Little Silver Hotel, Tenterden at 7pm. 8th Mar Visit to East Kent by Sally Light Chief Executive, MND Association. 2016 has been an interesting and successful year for MND Association East Kent Group. Campaigns Contact volunteers Greg Broadhurst (Manchester Branch), Colin Hardy (Northumberland Group), David Setters (East Surrey Branch) and Katy Styles (East Kent Group) were joined by Helen Setters and Mark Styles at the lobby. The year started with a party at the Wrotham Arms in Broadstairs, followed in very short order by a Support meeting in Folkestone and a visit to Westminster where 6 people affected by MND addressed some 42 Parliamentarians. Young Carers Awareness Day was also in January, which was followed by the Burns Night Supper at BinElla in Faversham. Mark and Katy Styles spoke to the Psychology Society at the University of Kent on Tuesday 23rd February. During April The Campaigning Toolkit, the brainchild of East Kent’s?Katy Styles was launched, A Masquerade Dinner in Tenterden raised almost ?10,000 and the?South Coast Road?Trip tee shirts went on sale, together with announcements of the events in East Kent. A brilliant Spring Lunch was held in May and the press release for the South Coast Road Trip was sent to all media outlets. June was the month of the South Coast Road Trip with 19 events in 17 days as Clive and Lynn Hudson travelled by public buses from Broadstairs to Land’s End, raising over ?10,000 and also creating great awareness of MND in the process. The Clock Tower in Herne Bay was lit up with MND colours and MND awareness day and The Podplus 5K run was yet again a success was a successful run raising funds for MND in East Kent. Campaigning were busy at Parliament for a Carer’s Week Reception representing pwMND and their carers. In August Summer was in the air with great music at the Broadstairs Summer Hop at The Pavilion, which followed on into the evening at the Wrotham Arms.? Daren Edwards was catching enormous fish in France and the signed road trip shirt went on display at David Niven House. Katy Styles addressed The National Council for Voluntary Organisations (NCVO)? Campaigning Conference on September 3rd, being the only volunteer to address the meeting.? On the same day Judy Keay attended Project Respect, which?is the MND Association?s Equality, Diversity and Inclusion Strategy ? and?all members are encouraged to help shape it. Clive Hudson, Mark? and Katy Styles attended the annual conference of the MND Association held in Derby on Saturday 10th September.? Please see http://mnda-eastkent.org.uk/wordpress/?p=1849 for full details. Anne Pomeroy walked 100KM along the Thames raising ?1650.93 for MND Association East Kent. The Co-op run from River to Mill Hill was on 30th September.? The run followed the diagnosis of MND given to local lady Linda Clarke.? The run raised over ?1000 for MND. See http://mnda-eastkent.org.uk/wordpress/?p=1876 for more information. We held a volunteer recruitment day in Canterbury in early October, the event was an interesting experience and we learned much about how to present any future recruitment day. Unfortunately it was a foul day and we were not successful in gaining any new volunteers. Judy Keay, Chrissie Batts and Mark and Katy Styles attended a Parliamentary Reception on October 18th, representing the East Kent Group. They all spoke with?Julian Brazier, MP for Canterbury and Whitstable who attended and promised to follow up the points made at the reception, and other MP’s at the reception. ?Mark and Katy also spoke to the Minister, Penny Mordaunt about their concerns . Our year ended by funding the installation of a hoist for Martin living with MND, making a contribution to our CEO annual appeal and enjoying a wonderful Christmas Lunch at Yarrow Hotel in Broadstairs.